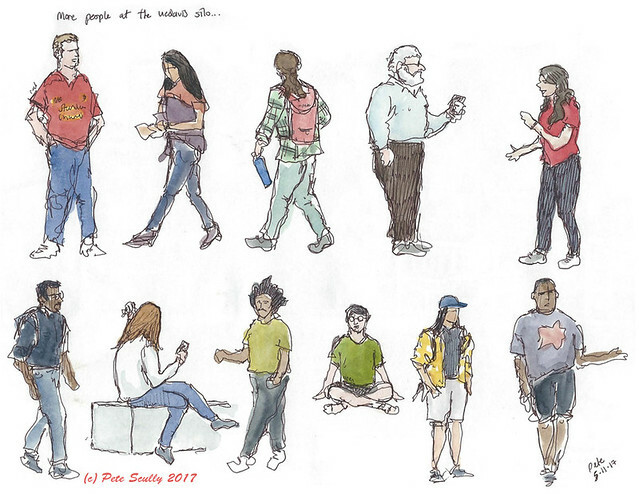 As some of you may know, I have a book out called “Five Minute Sketching People”. It came out in the autumn and has been apparently doing well; I don’t really know exactly how well, I’m not told these things, but I often check the ranking on Amazon. And then, to compare, I always check the ranking of Zlatan Ibrahimovic’s book, “I Am Zlatan”. I don’t check it against any other book, only that one. And every day I would check, and my book would be above it in the Amazon rankings. I’d be at 26,000, Zlatan would be at 46,000. It was always up and down, but I’d usually be higher than “I Am Zlatan”, so regardless of how high it actually was or what any of it means, as long as I was above “I Am Zlatan”, that was all that mattered, beating Zlatan. I mean it doesn’t mean I’m somehow better than Zlatan, that would be ridiculous, all I’m saying is that the numbers don’t lie, and clearly my next book should just be called “I Am Better Than Zlatan”, obviously. It’s a fun game I play every day. And then recently I noticed that Zlatan had overtaken me. Is it because he is finishing up his contract at Manchester United, that saw a spike in his book sales? I too do not play for Manchester United. Coincidence? And the worrying thing is, he has stayed there! Today for example he is at #57,515 and I am at #88,844. Now I don’t doubt that Zlatan is a great writer, after all He Is Zlatan, and admittedly he is slightly more globally well-known than I am, him being a Premier League/Serie A/La Liga, Ligue 1/international superstar, and me being a bloke who draws pictures of things in a town nobody has heard of. So, fair play to him. 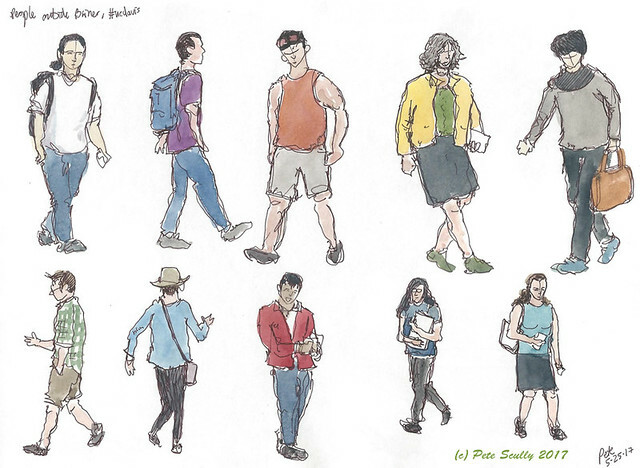 Oh, these by the way are some of my quick people drawings from the past month or so. 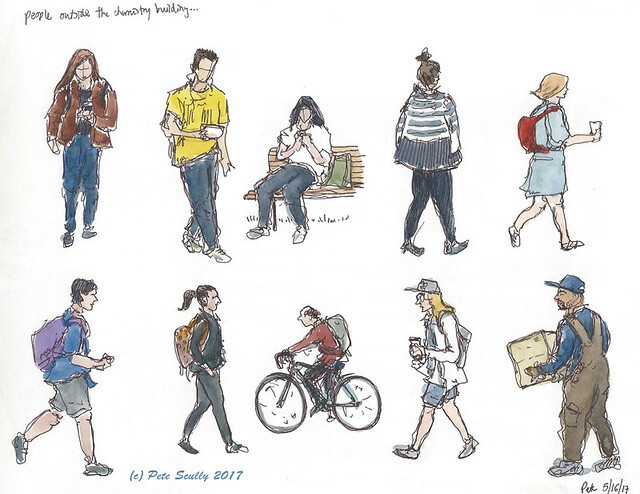 These are the sorts of ones I did in the book, simple, quick, passers-by, capturing what you can in a tiny amount of time, most of them being at UC Davis, except the ones at the top which are at the Farmer’s Market. 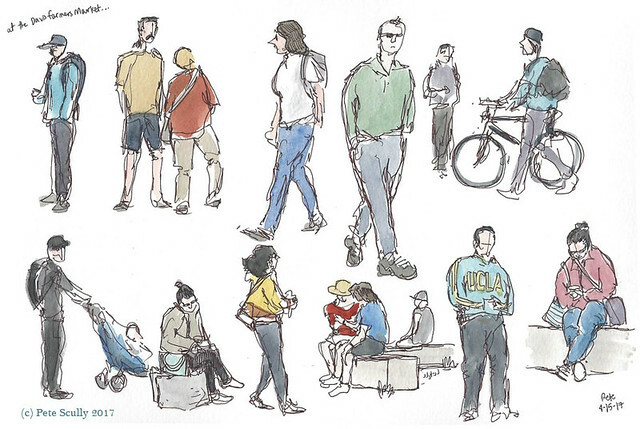 Many were sketched at the Silo, or nearby, sketched on days when my lunchtime wasn’t long enough for a building sketch (or I just had no inspiration to draw more buildings). 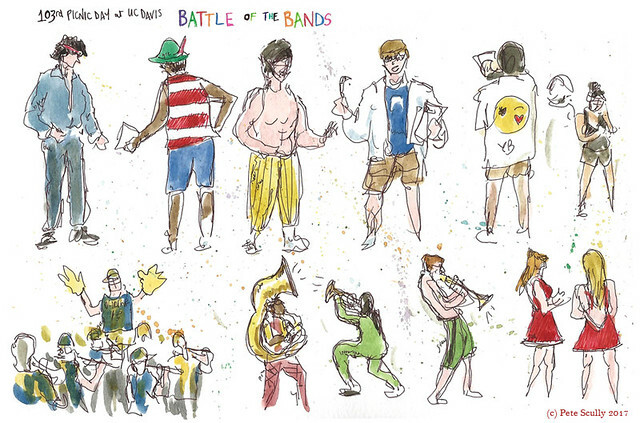 The ones immediately below were sketched at the UC Davis Picnic Day, Battle of the Bands. Hence the funny costumes. It’s all very silly. The whole Zlatan thing is just a bit of a joke I have with my son, we find it funny to look up the numbers. I did notice recently though that someone had given my book a “1 star” rating. I mean I don’t mind, that’s fine, but I had to look at it anyway. They wanted to see step-by-step tutorials rather than tips on techniques, you see, which I totally get. They even said I was a good artist, which I do appreciate. But, 1 star? I mean I don’t care obviously, but that 1 star, it stands out, like Sirius glaring at the constellation of Orion. I looked and saw they had given 1 star to the other book in the series, the one Liz Steel wrote about 5-minute Architecture Sketches. In fact they had written exactly the same review word for word, which saves time I suppose, and to be fair they changed the word ‘him’ to ‘her’ for the other review so it’s not a total cut and paste. But it’s totally fine. I had a look at what else they had given 1 star to, just out of interest, and the next 1-star was for a book called “Guns: Weapons Guide for Total Beginners”, because “the only picture was on the cover”. Which is a fair assessment. He gave 5 stars to “Think Like A Winner” though, which sounds like a book I could use, though I must point out that book is even further below “I Am Zlatan” than I am, so. I looked to see if Zlatan had any “1 star” reviews, and was pleased to discover that unfortunately he had two. And they aren’t really very good reviews either. One said that they were a huge fan of Zlatan as a player but that his book was “full of ego and painful to read”. (Haha, just wait until “I Am Better Than Zlatan” comes out!) But “painful to read”? More painful to read than a 1 star review? The Darkhold is painful to read, or The second one said that “There is a lot of “I” in his book. Its really not that good.” Now to be fair, you need to use the letter “I” a lot in english, otherwse t mght look lke ths. You see? Also, the book is called “I Am Zlatan”, which yes it starts with the letter “I”, but he left out his last name, which has at least three “I”s in it, maybe more. Also there are a lot of lower case “L”s, which could be mistaken for “I”s. If however the reviewer is referring to the fact he talks about himself a lot, well, Zlatan is guilty as charged, but what with it being an autobiography, that is to be expected, unless you think an autobiography is a biography of a car. But if the reviewer really thinks Zlatan is a massive egotist, well he’s wrong, and he proves it by saying that he uses “I” a lot. Truly massive egos don’t do that, they prefer using the third person, like “Zlatan is hungry, Zlatan wants a new contract,” or like Pete does in his profile page on this very website. In fact if he was truly as egotistical as these reviewers think, his book would have been called “Zlatan is Zlatan”. You’re probably wondering who this “Zlatan” even is, don’t worry about it, he’ll come up again I’m sure. He is a very good footballer, look him up on Youtube, his skills are amazing. Buy his book too, keep it above mine in the charts, I don’t mind honestly. 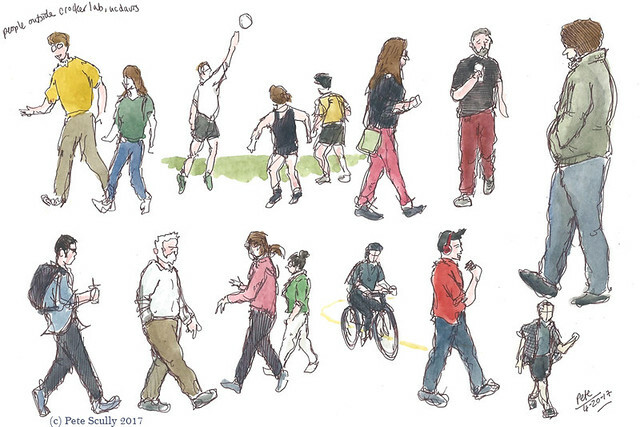 The figure in the second row, second to the left looks a bit Zlatan-like, though he is significantly taller, a very tall bloke. 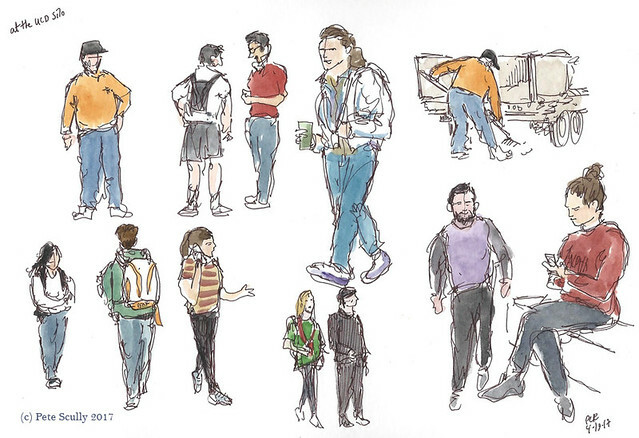 By the way the fellow in the above sketch, bottom row, yes that one, he is not yogic-flying, he is in fact sitting on grass that you cannot see. Invisible grass. 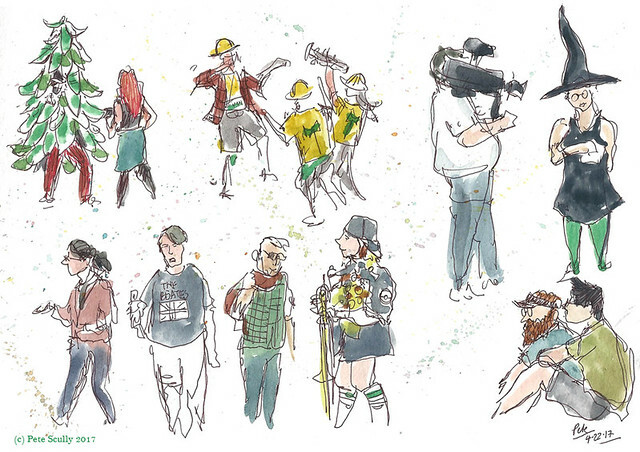 And yes, top left bloke is wearing a Liverpool shirt. 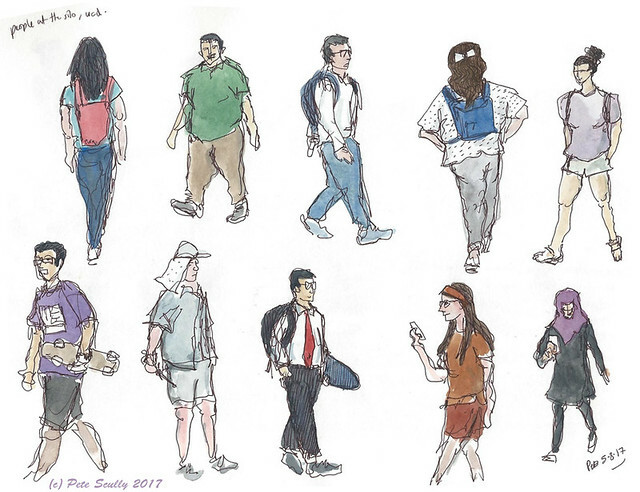 Anyway, these are my recent quick people sketches, I do hope you like them and if you have five minutes why not do some yourself? Publish ‘I am Pete’ and let’s have a real ding-dong. Best be quick though coz I think the Big Z is at the end of his career and will be moving to Japan or China to be put out to grass. Everyone’s a critic! ;-) Love these people, who are individuals and not generic.